UPDATED: November 19, 2014, 1:40 a.m. 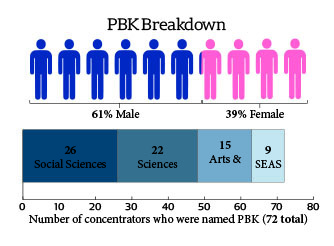 The names of 48 seniors elected to Harvard’s Phi Beta Kappa chapter were released Monday by Jeffrey Berg, assistant director at the Office of Undergraduate Research and Fellowships. Election to the Senior 48 list is based largely on an individual’s academic performance as well as courseload difficulty and diversity. The selection follows the announcement last spring of the society’s Junior 24 list, which recognized two dozen members of the Class of 2015 for extraordinary academic achievement. Five of the seniors concentrate in Social Studies, which was the most common major among the inductees. Yet many of the seniors elected are sole representatives of their concentration, including inductees from English, Physics, and African and African American Studies, among others. Inductees from Kirkland and Quincy Houses outnumbered those from other Houses, with each House contributing seven students each. English concentrator Amy C. Robinson ’15, who lives in Dunster House, said she appreciated her nomination and noted that students studying writing often pursue diverse academic paths. Many students traced their success back to the classroom and campus. Sharon Zhou ’15, a joint classics and computer science concentrator, attributed much of her achievements to those around her. Despite the prestige of the selection, some students were ambivalent about what their election to the chapter actually means. “I think it's an honor to be able to get [elected], but I'm not sure what exactly it signifies. It doesn't prescribe my success for the future,” said Yuechen Zhao ’15, a computer science concentrator in Leverett.